I think you really want FAST and FASTER! The main reason I haven't already installed them in my car is because of this.. I will do it this weekend and provide the install pics so you can see just how simple it is. Cool, I'll wait to see how easy they go in. Me and tools don't get along very well. Things tend to get broken when I pick them up and never work again. Just need to confirm, this will fit with ease on E63 right? LOL.. its really easy.. 1 torx screw driver and a small flat head screwdriver is all you need. I am not 100% sure. 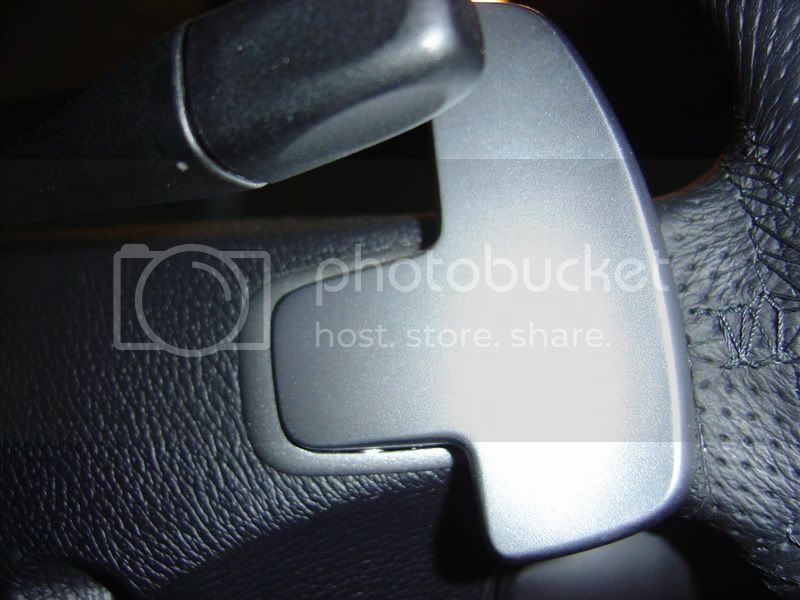 I have a feeling your car has the bigger openings for the paddles (like the aluminum OEM paddles I posted the pics of).. Worst case scenario, do you want to buy the aluminum MB set that I purchased to take measurements? They are brand new and not a scratch on them. Why would I buy the aluminum ones when I already have them? Isn't the pic of the one you installed on a 63 car? LOL.. Ok.. You got me on that one.. If you can take a pic of the back of your steering wheel I can tell you for sure... The one that we test fitted was not a 63. I believe your car has the newer paddles with the bigger mounting points..
don't you already have paddles??? *edit. you just posted again and i realize you want black ones. vrus, will do it this afternoon and post pics asap. chiro: I want the piano black ones vrus are making... looks so good! What model was it tested on? With a 63 steering wheel conversion? I want a 63 steering wheel. They grip much better than the 55 ones. any update on these thing Victor?? Victor, I think that the shiny Piano Black clashes with the existing matt/textured black switch gear in our cars, making it look less OE. That's why I thought SILVER was a safer choice as it matches other silver bits like the gear shift surround. 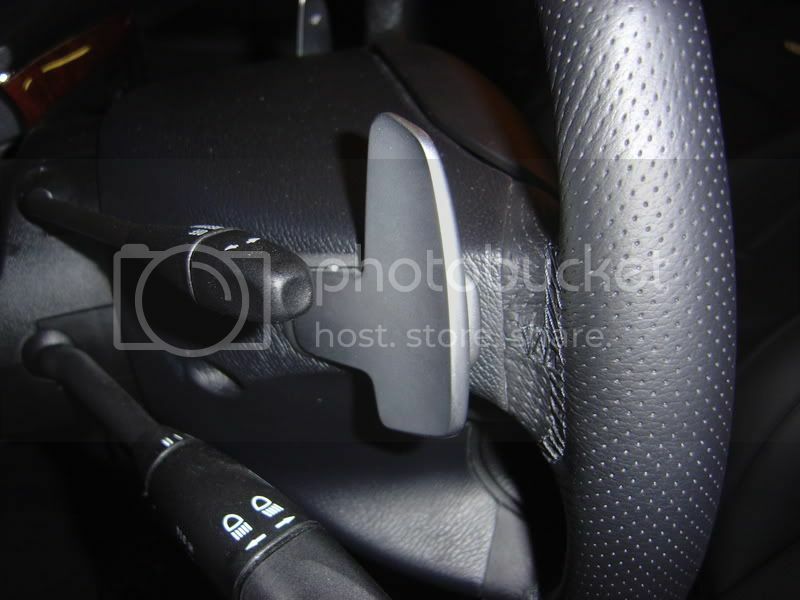 Any news on the paddle "ergonomics" on MP Design steering wheels? 1) I've got *** 2 *** Piano black paddles with NO ETCHINGS (blank) just like the first set of pics I posted that are available.. This is just in case someone here wants to try them out and doesn't want to wait for the etched versions. If anyone wants to be an early adopter, I can have them air shipped to me and send them out within a couple of days. Anyone who wants them either PM me or email me. I will offer them in priority order based on the order the deposits came in.. If no one from the deposit list wants them, they will go on a first come first served basis. 2) Mogz: Sorry buddy.. Looks like all the new cars with existing paddles use the large mounting holes.. Those paddles are the same as the MB Aluminum paddles I posted the pic of.. These new custom ones I am making wont fit on the new cars because of the differences in mounting. Also, the new cars use a screw to fasten to the steering wheel so not only is the size different but the mounting mechanism is different also. 3) I am awaiting a delivery and production schedule timeline from the factory. I will post all of that info once it is available. Please keep us posted on the Aluma-look ones as well. Victor, Emailed you about the non ecthed paddles.. Ill take them if available. Sign me up. Please PM me for the payment method. 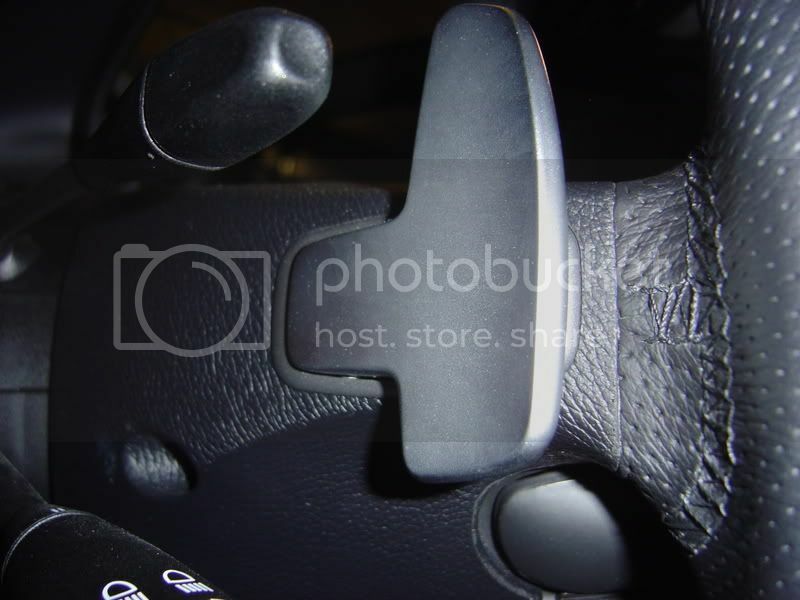 I have a 2003 CLK55 - with buttons (not paddles) on the back of the steering wheel - will these fit in place of the buttons? Will you ship to the UK? And if so do you know how much shipping will cost? Interested in silver ones as well. +/- or Up/Down, doesn't matter. 1) Please do not send in deposits unless you want the Piano black paddles. Jim, I received your deposit but I am going to refund it.. I dont want to take any money on the aluminum ones until I can see what a finished product looks like to make sure the quality and finish is acceptable. 2) I attempted to install the paddles in my car this weekend but we discovered there ARE some differences between the various 55 cars. My associated who is working with me on creating these paddles test fit a pair into a CLK55 and a CLS55 and both were fine.. On the E55 the buttons must be a different size & shape because they dont quite fit on my car. I sent him back some info and we are currently in the process of ordering every type of steering wheel button MB makes to make sure that these paddles are compatible with all of them. Now, saying that, is there anyone with a CLK55 or CLS55 that wants a set of PIANO BLACK paddles WITHOUT etchings? I've got 3 sets that we made (including the set I have in my hands now). I'd love to see them installed on someone's car and get some feedback.. Anyone want to be an early adopter?? Victor, am i going to have a fitment problem with the ones your sending me?